Chances are, we all hit a rough patch from one time to another. It doesn’t seem to matter what else is going on, there are times an unexpected layoff happens, a financial setback or personal emergency totally throws us off kilter. 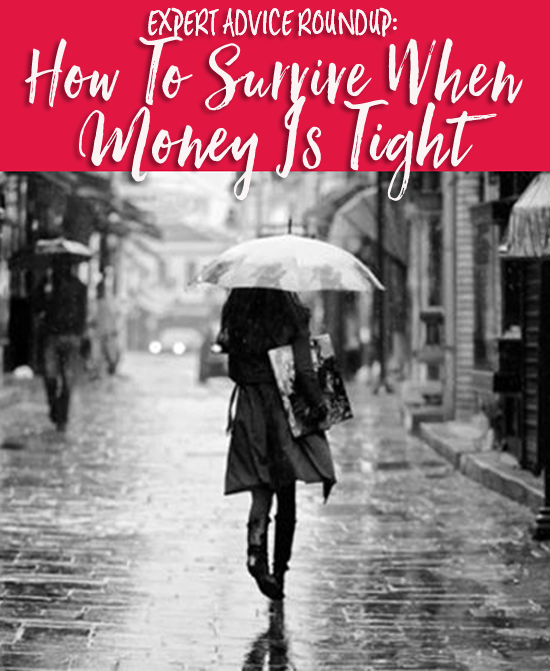 Other times, it can be a dark and gloomy period when we realize it’s going to take longer than we anticipated to pay off a debt, or we simply aren’t making as much as we need to in order to scrape by. Yes, there are tough times, and the way out of a rainy day can seem long a long and lonely road- but luckily we aren’t alone in our struggles! This week, we’ve asked personal finance bloggers who have been there to share their best advice for anyone going through a tough financial time. Read on and keep calm and carry on! Take Any Action. Even Small Steps Build Momentum. Don’t Be Ashamed, Use Your Connections. Clear Your Mental Clutter, & Then Set Positive Affirmations. Write Down Every Dollar You Spend. Set Mini-Goals For Yourself As A Pacesetter For The Bigger Goals. Don’t Get Stuck In A Rut At Home Because You’re Broke. Visualize What You Hate To Get What You Love & Stay Motivated. Don’t Go It Alone, Now Is The Time To Call In Favors & Lean On People. Confide In the RIGHT Person, Not Just A Buddy- But An Accountability Partner. No matter where you’re at in your financial journey, we hope these tips were helpful to you! It can be easy to feel overwhelmed and anxious, but today you can take even a small step towards empowerment. You got this! Great post! I have to agree, exercise can be a big endorphin booster (which is extremely helpful during the winters here in Indiana where I barely see daylight – talk about depressing!). It can be hard sometimes to stay on the financially responsible path, especially when your friends are buying new cars or going on weekend ski trips or even just eating out at restaurants every once in awhile ; however, I always think that by staying the course, I’m going to be the one who has all that AND financial freedom, which is the ultimate combo. Good luck to all of you who have to resist all that temptation with me – remember, the Jones’ are drowning in debt! of clients, you will see that you can earn as much as you want. you make allowance for cleaning different parts of the house on different days. All really good advice. 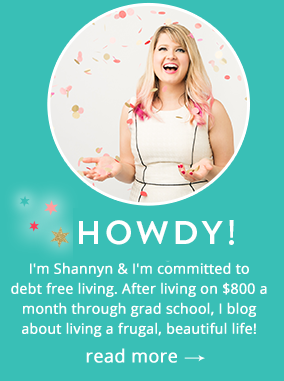 The first step for us was coming to terms with the amount of debt we owed. It was quite sobering, but gave us the necessary sense of urgency to start doing something about it. We’ve also let go of the shame. I will tell people that we have a lot of debt and then, the ways we’ve changed our life in order to pay it off. Thanks for this uplifting post.